I want to spend more time with the first two episodes before going on to 3 and 4. Talking about rewatching and percolating. Plenty of time before #5 is available. I want to spend more time with the first two episodes before going on to 3 and 4. Talking about rewatching and percolating. Plenty of time tbefore #5 is available. I've already rewatched the first two episodes. They definitely grew on me when I saw 3 and 4 and understood what they where going for. It feels so weird watching new episodes of this. I saw the first seasons 10 years ago so I can't imagine how weird it must feel if you actually saw this 25 years ago. and fro any negative comments...keep in minds its ab 18hr film. WAIT until ep 18 credits are complete. sorry that im not typing more. i miss the times on here where i could chat longer. but again i love it. and again. i hope all is well with you guys - miss y'all. wish it was 2003 again. I Started watching the the original series when I heard about the new series on Showtime. I'm currently on episode 3 of the 2nd season. I plan to watch the full run of the original series, then Fire Walk With Me, then The Missing Pieces before watching the new series. 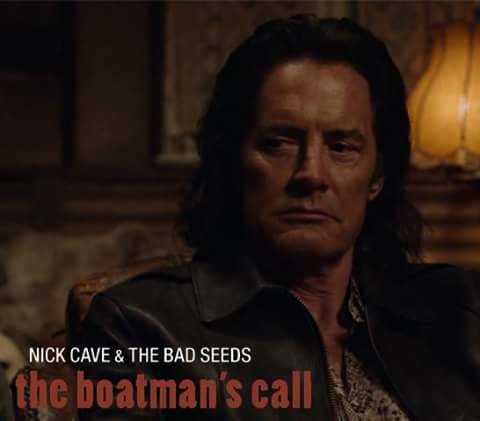 I was never really into Lynch before this, but watching this show has mad me a fan and makes me want to watch his other films which, aside from the Elephant Man, I have never really been especially interested in for the most part. That said, the original series is really hit or miss so far, but the hits are so so much bigger than the misses. It's quite amazing to realize this show aired on broadcast television in the very early 90s. Anyways, I look forward to contributing here after I've circumnavigated the preexisting world of Twin Peaks. We've had two episodes mention Philip Jeffries, and yet no "in memory" for Bowie in any end credits so far. Anyone care to speculate whether he actually did secretly shoot a cameo before he passed? I think I might wait and binge-watch the next 2-3 episodes. It's feels like i'm watching a film 10 minutes at a time and it's pretty annoying. Good so far tho! Yes, agree with that vibe. But that's what it is, a 18 hour movie. The "episodic" elements of the show feel like they're only there to placate/infuriate the viewer. Somewhere said that the most recent ep was the best since #1. Not sure I agree with that, but it did feel a bit more cohesive than some of the past few. But even the previous episode had three standout moments that this one lacked. I'm kinda mad at myself because I called Laura Dern but neglected to post here. Um. Yeah. That was definitely one of the most magnificent things to ever be on television. I was like, wow I did not expect a NIN concert video in the middle of this episode, that's weird! Oh how naive I was. David Lynch just does what he wants. I feel like he has now reached total dominance. That frog-roach, though. Really. And those freaking demons. I was just almost done being haunted by the icepick murder scene from two weeks ago.